The Consolidated Appropriations Act, 2016 , provides funding for the Federal Government through September 30. NIGMS has a Fiscal Year 2016 appropriation of $2.512 billion, which is $140 million, or 5.9%, higher than it was in Fiscal Year 2015. With this opportunity to expand NIGMS support for fundamental biomedical research comes a responsibility to make carefully considered investments with taxpayer funds. One of the most commonly cited metrics when discussing grants is success rate, calculated as the number of applications funded divided by the number of applications received. As shown in Figure 1, the success rate for NIGMS research project grants (RPGs) increased from 24.8% in Fiscal Year 2014 to 29.6% in Fiscal Year 2015. This was due to an increase in the number of funded competing RPGs as well as a decline in the number of competing RPG applications. In contrast, in Fiscal Year 2013, applications increased while awards decreased, leading to a notable decrease in success rate. Overall, we have seen a decrease in RPG applications over the last 2 years, a trend warranting additional investigation. Figure 1. 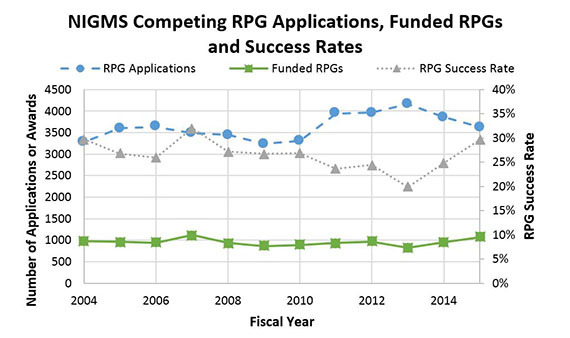 Number of NIGMS Competing RPG Applications, Funded Competing RPGs and Success Rates for RPGs, Fiscal Years 2004-2015. NIGMS RPG applications (blue circles, dashed line; left axis) decreased from Fiscal Years 2014 to 2015 to a 5-year low. Meanwhile, NIGMS-funded RPGs (green squares, solid line; left axis) increased in Fiscal Year 2015 to a level not seen since Fiscal Year 2007. As a result, the NIGMS RPG success rate (gray triangles, dotted line; right axis) was the second highest it has been in the past decade. The Consolidated and Further Continuing Appropriations Act, 2015 , provides funding for the Federal Government through September 30. NIGMS has a Fiscal Year 2015 appropriation of $2.372 billion, which is $13 million, or 0.5%, higher than it was in Fiscal Year 2014. As I explained in an earlier post, we made a number of adjustments to our portfolio and funding policies last fiscal year in order to bolster our support for investigator-initiated research. Partly because of these changes, the success rate for research project grants (RPGs)—which are primarily R01s—was 25 percent in Fiscal Year 2014. This is 5 percentage points higher than it was in Fiscal Year 2013. Had we not made the funding policy changes, we predicted that the success rate would have remained flat at 20 percent. 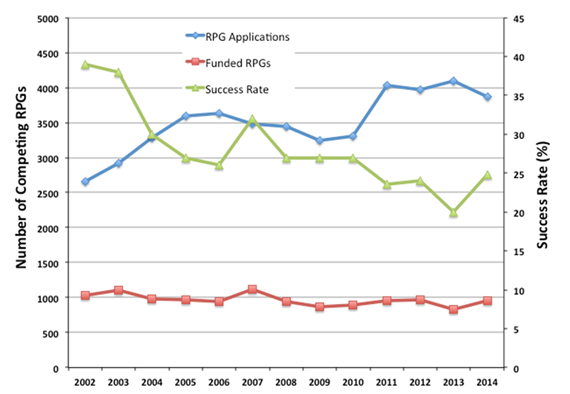 Figure 1 shows the number of RPG applications we received and funded, as well as the corresponding success rates, for Fiscal Years 2002-2014. Figure 1. Number of competing RPG applications assigned to NIGMS (blue line with diamonds, left axis) and number funded (red line with squares, left axis) for Fiscal Years 2002-2014. The success rate (number of applications funded divided by the total number of applications) is shown in the green line with triangles, right axis. Data: Tony Moore. Moving forward, it will be important to employ strategies that will enable us to at least maintain this success rate. In keeping with this goal, we recently released a financial management plan (no longer available) that continues many of the funding policies we instituted last year. As funds from the retirement of the Protein Structure Initiative come back into the investigator-initiated RPG pool, we’ll be working to ensure that they support a sustained improvement in success rate rather than create a 1-year spike followed by a return to lower rates. 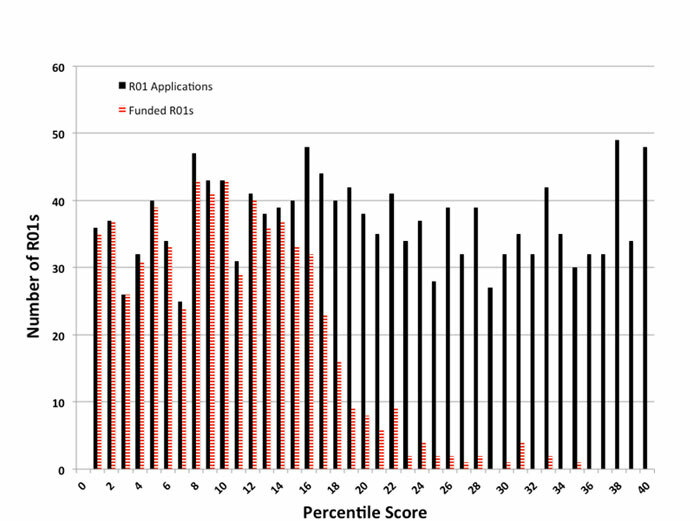 Figures 2 and 3 show data for funding versus the percentile scores of the R01 applications we received. People frequently ask me what NIGMS’ percentile cutoff or “payline” is, but it should be clear from these figures that we do not use a strict percentile score criterion for making funding decisions. Rather, we take a variety of factors into account in addition to the score, including the amount of other support already available to the researcher; the priority of the research area for the Institute’s mission; and the importance of maintaining a broad and diverse portfolio of research topics, approaches and investigators. Figure 2. 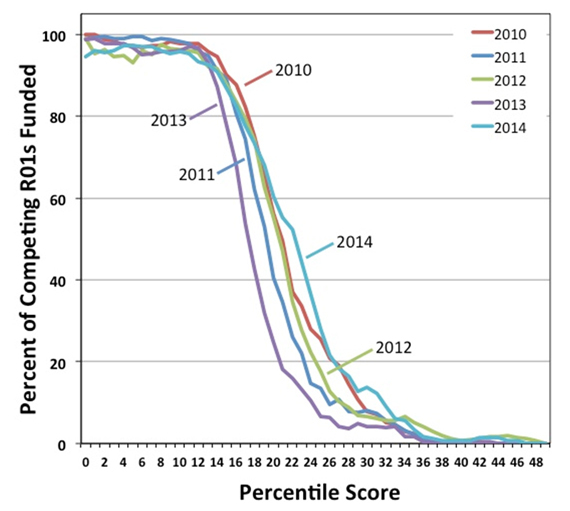 Percentage of competing R01 applications funded by NIGMS as a function of percentile scores for Fiscal Years 2010-2014. For Fiscal Year 2014, the success rate for R01 applications was 25.7 percent, and the midpoint of the funding curve was at approximately the 22nd percentile. See more details about the data analysis for Figure 2. Data: Jim Deatherage. Figure 3. Number of competing R01 applications (solid black bars) assigned to NIGMS and number funded (striped red bars) in Fiscal Year 2014 as a function of percentile scores. See more details about the data analysis for Figure 3. Data: Jim Deatherage. It’s too early to say what the success rate will be for Fiscal Year 2015 because it can be influenced by a number of factors, as I described last year. However, we’re hopeful that by continuing to adjust our priorities and policies to focus on supporting a broad and diverse portfolio of investigators, we can reverse the trend of falling success rates seen in recent years. We recently posted our financial management plan for Fiscal Year 2014 (no longer available) and a budget table showing our Fiscal Year 2014 operating plan by mechanism (no longer available). Consistent with our emphasis on bolstering our commitment to investigator-initiated research, we’re making every effort to move financial resources into research project grants (RPGs), which include R00s, R01s, R15s, R21s, R37s, P01s, DP1s, DP2s and U01s. We estimate that these efforts will increase our RPG success rate from 19.9% in Fiscal Year 2013 to more than 22% in Fiscal Year 2014. This translates into funding about 100 more competing RPGs than we did in Fiscal Year 2013. We will fund noncompeting RPGs at the committed levels. We will restore those already funded at 90% to the committed levels. The overall average cost of competing RPGs will be at approximately 2% above the Fiscal Year 2013 level. We will fund noncompeting IDeA and AIDS research centers, which have required budget levels or a specific mandated policy, at the committed levels. We will reduce other P41, P50 and U54 noncompeting awards by 10% from the committed levels. We will revise those already funded at levels below 90% accordingly. Future funding levels for these center mechanisms will depend on the Institute’s budget and efforts to increase support for our investigator-initiated RPG pool. We will increase Ruth L. Kirschstein undergraduate and graduate student stipends by 2%. Entry-level postdoctoral stipends will increase to $42,000, with 4% increases between the years of experience levels. See NOT-OD-14-046 for the full range of Fiscal Year 2014 stipends. We will continue to support new investigators on R01-equivalent awards at success rates comparable to or better than those of established investigators submitting new (Type 1) R01-equivalent applications. Looking ahead to Fiscal Year 2015, you can find information about the President’s budget request for NIH and read the NIGMS Fiscal Year 2015 budget justification to learn more about the specifics of the proposed budget for our Institute. On January 17, the President signed into law the Consolidated Appropriations Act of 2014 , funding the Federal Government for the remainder of the fiscal year and providing increased support for NIH relative to the post-sequester levels of 2013. The NIGMS Fiscal Year 2014 budget is $2.359 billion, which is about $66 million, or 2.9%, higher than it was in Fiscal Year 2013. It’s too early to know what this will mean for the NIGMS grant application success rate—the number of competing R01 applications we fund divided by the total number of competing R01 applications we receive. A number of other, largely independent factors in addition to the budget can impact the success rate, as well. We hope that our latest analysis of NIGMS funding trends illuminates the interplay among some of these factors. Thanks to Tony Moore, Jim Deatherage and Ching-Yi Shieh for help with the data collection and analysis. Figure 1 shows the percentage of R01 applications funded by NIGMS as a function of percentile scores for Fiscal Years 2009-2013. Fewer grants scoring above about the 12th percentile were funded last year than in the previous 4 years. In fact, the funding curves shifted more to the left each year in this period, except in 2012, which had a slightly better success rate than 2011. This was due in part to a dip in noncompeting R01 grants that had to be funded along with no increase in the number of competing applications relative to 2011. (For a 4-year R01, the second, third and fourth years are all noncompeting grants because they are funded without review by a study section. The funds required to pay the noncompeting awards are often referred to as “out-year commitments.”) Funding levels fell again in Fiscal Year 2013 due to the sequester cuts and increases in the numbers of competing applications and noncompeting grants (see below). Figure 1. 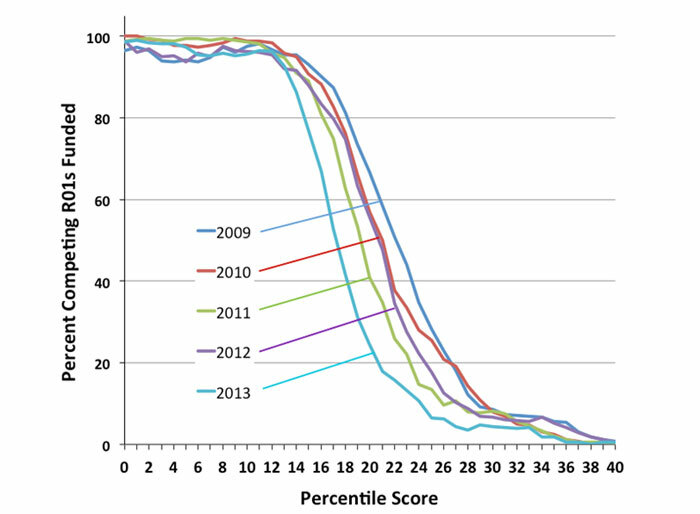 Percentage of competing R01 applications funded by NIGMS as a function of percentile scores for Fiscal Years 2009-2013. 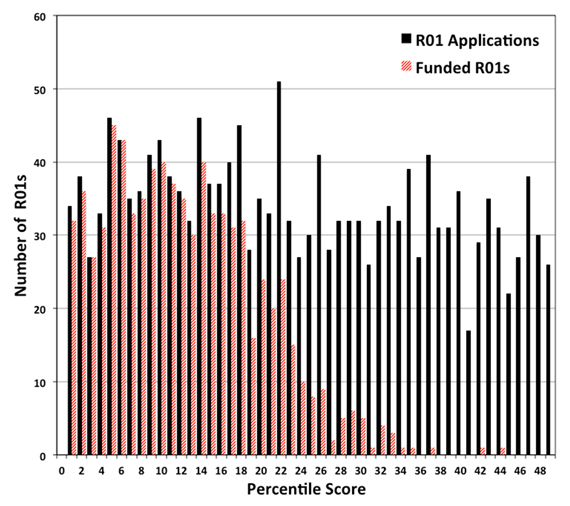 For Fiscal Year 2013, the success rate for R01 applications was 21%, and the midpoint of the funding curve was at approximately the 17th percentile. See more details about Figure 1 analysis. Figure 2 presents a more granular view of the data for Fiscal Year 2013. The solid black bars correspond to the number of NIGMS competing R01 applications that scored at each percentile. The striped red bars show the number of these applications that we funded. Figure 2. 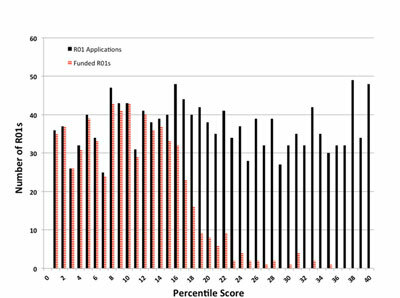 Number of competing R01 applications (solid black bars) assigned to NIGMS and number funded (striped red bars) in Fiscal Year 2013 as a function of percentile scores. See more details about Figure 2 analysis. Figure 3 shows the success rate for Fiscal Years 2000-2013 (green line with triangles; right axis), the total number of NIGMS R01 applications each year (blue line with diamonds) and the number of funded competing R01 grants (red line with squares, left axis). Between Fiscal Years 2000 and 2003, the last year of the NIH budget doubling, the success rate was 37-38%. After the budget doubling ended, the success rate declined, falling to 26% in 2006. In 2007, the success rate jumped to 33%, largely due to a combination of a budget increase for NIH and a dip in the number of noncompeting grants NIGMS had to fund that year. (See below for more about changes in the number of noncompeting grants.) Over the next 6 years, the success rate for R01s dropped to 21%, the lowest level in two decades. Note that the Fiscal Year 2013 success rate for all research project grants (RPGs), which include R00s, R01s, R15s, R21s, R37s, P01s, DP1s, DP2s and U01s, was 19.9%. This is lower than the success rate for R01s alone, which was 21%. Figure 3. Number of competing R01 applications assigned to NIGMS (blue line with diamonds, left axis) and number funded (red line with squares, left axis) for Fiscal Years 2000-2013. The success rate is shown in the green line with triangles (right axis). One reason the success rate has fallen is that the number of applications increased between Fiscal Years 2002-2005 and then again between Fiscal Years 2010-2013. Similar trends are seen NIH-wide and are the result of a 50% increase in the number of investigators applying for grants along with a smaller increase in the average number of applications submitted per investigator. Another factor that influences the success rate is the number of noncompeting awards. The more noncompeting awards we need to make in a given year, the fewer competing grants we can fund. The number of noncompeting RPGs cycles with a 4-year period, as shown in Figure 4. Figure 4. Number of noncompeting (blue line with diamonds, left axis) and competing (red line with squares, right axis) RPGs funded by NIGMS for Fiscal Years 2000-2013. Note that the Y axes do not start at 0. This cycle was apparently set in the early 1990s when the Institute shifted the duration of most competing RPGs from 5 to 4 years. The result was that the last group of 5-year awards and the first group of 4-year awards ended in the same year, creating a significant dip in noncompeting grants and a corresponding jump in competing grants that the Institute could fund. The bolus of grants awarded that year kept noncompeting commitments high for the next 3 years, until they all came up for renewal again. As you can see in Figure 4, the cycle has persisted to this day. The cycle may lead you to wonder if you should try to time your application to correspond to a trough in noncompeting grants. You might get lucky and have all of the factors that drive success rate work in your favor. However, if other factors act to decrease the success rate, you might end up worse off. For example, even though 2011 was a trough year for noncompeting grants (Figure 4, blue line with diamonds), a jump in the number of applications (Figure 3, blue line with diamonds) worked in the opposite direction, and the success rate actually fell (Figure 3, green line with triangles). Finally, the Institute’s budget is also a factor in determining the success rate. 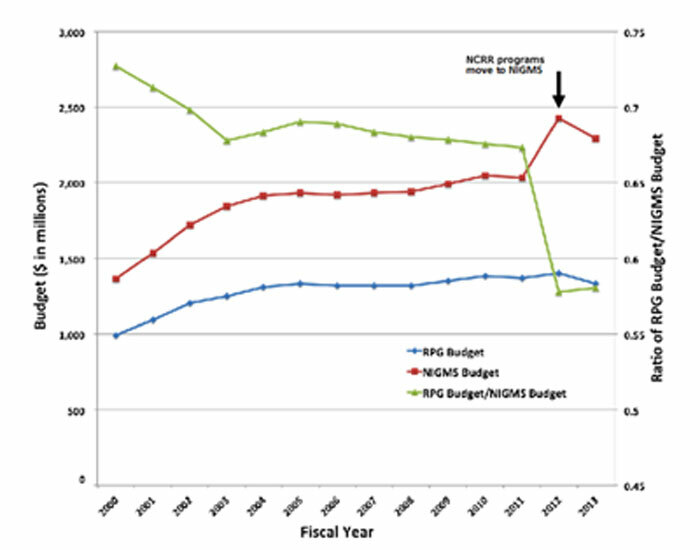 Figure 5 shows the NIGMS budget (red line with squares, left axis), the budget committed to competing and noncompeting RPGs (blue line with diamonds, left axis) and the ratio of the RPG budget to the total NIGMS budget (green line with triangles, right axis). Figure 5. Total NIGMS budget (red line with squares, left axis) and budget committed to competing and noncompeting RPGs (blue line with diamonds, left axis) for Fiscal Years 2000-2013. The green line with triangles shows the ratio of the RPG budget to the total NIGMS budget (right axis). The jump in the NIGMS budget and corresponding drop in the RPG/NIGMS budget ratio occurred when large, primarily non-RPG programs were transferred to NIGMS along with their associated funds from the former National Center for Research Resources. The Institute’s budget grew during the NIH budget doubling (1998-2003). It also jumped by nearly $400 million when the Institutional Development Award (IDeA) and Biotechnology Research Resources programs moved from the former National Center for Research Resources to NIGMS. A variety of pressures were responsible for the ~2% decline in the ratio of RPG funds to the NIGMS budget that occurred during Fiscal Years 2005-2011, including commitments to targeted initiatives and increased funding for training programs. Because we don’t yet know the number of applications we will receive or the number of noncompeting grants that will end early due to retirements or other events, we can’t predict what our success rate will be in Fiscal Year 2014. We hope, however, that the steps we are taking to bolster our commitment to investigator-initiated RPGs will have a positive impact on the success rate. As part of an ongoing examination of our grant portfolio to ensure that we invest taxpayer money as effectively and efficiently as possible, we recently analyzed changes over time in the distribution of investigator-initiated research compared to research funded through targeted funding opportunity announcements (FOAs). 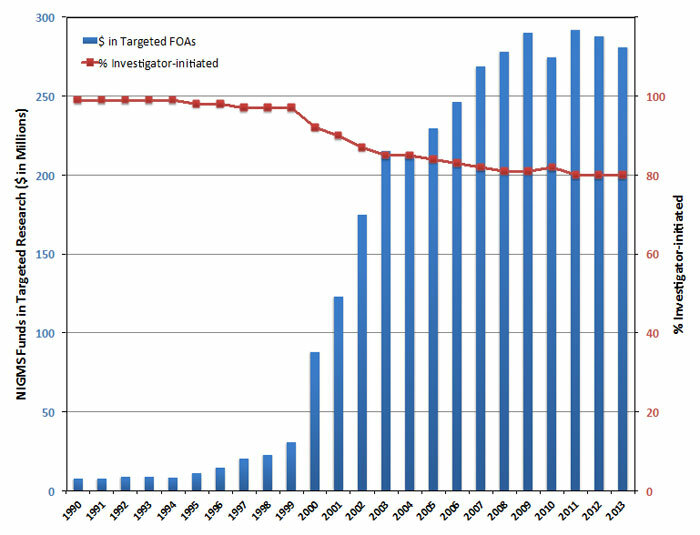 Changes over time in NIGMS investments in investigator-initiated research (research grant funds not associated with targeted FOAs) (right axis) and research funded through targeted FOAs (left axis). The analysis does not include fellowship, career development and training awards; programs transferred to NIGMS from the former National Center for Research Resources; and some other programs. For more details about the analysis, which was performed by Jim Deatherage, chief of our Cell Biology Branch, see the NIGMS Funding Trends Web page. 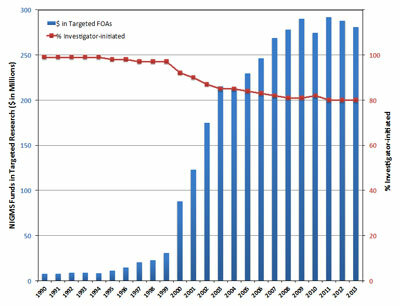 The figure shows that in the early 1990s, 99% of NIGMS’ grant budget supported investigator-initiated research, compared to 80% today. During the budget doubling in Fiscal Years 1998-2003, the Institute’s investment in research funded through targeted FOAs increased dramatically, then continued to increase at a slower rate during Fiscal Years 2004-2009. As I discussed in a previous post about our large-scale research initiatives and centers, there were many good reasons for using FOAs to target specific areas of research with some of the funds made available by the budget doubling. For example, FOAs allowed the Institute to experiment with catalyzing the development of such new and emerging fields as structural genomics, pharmacogenomics and systems biology. Since the budget doubling ended, however, maintaining steady support for our targeted research portfolio has made it difficult to maintain steady support for investigator-initiated research project grants (RPGs). Partly as a result, the success rate for RPGs (the number of funded RPGs divided by the number of RPG applications) fell below 20% in Fiscal Year 2013. Although a number of factors have contributed to the declining success rate, a significant one is that targeted and investigator-initiated research grants compete directly with each other. To bolster the success rate, we need to decrease our commitment to targeted FOAs. Furthermore, because none of us knows where the next major advances will arise, the soundest investment strategy is to have a distributed portfolio in which researchers investigate a wide range of scientific questions. History strongly suggests that letting scientists “follow their noses”—which involves a combination of curiosity, expertise, creativity and serendipity—is the most productive route to findings that will eventually translate into medical and technological breakthroughs. To rebalance our portfolio in order to renew and reinvigorate our commitment to investigator-initiated research, we will be reducing our use of targeted FOAs, generally reserving them for cases in which they are likely to have a major impact on a large segment of the biomedical research enterprise. These cases could include promoting the rapid development of accessible, cost-effective new technologies that enable major advances in understanding biological systems; more efficiently organizing the Nation’s basic biomedical research resources to provide scientists throughout the country access to high-end instrumentation and technical expertise; and, in some instances, using targeted FOAs with defined lifetimes to catalyze the rapid development of emerging research areas. It is important to note that we are making a distinction between investigator-initiated research and targeted research, not between investigator-initiated research and team science. We strongly support team science, which can certainly be investigator-initiated, and we expect such collaborative efforts to increase as research probes more deeply into the complexities of living systems. Currently, team-based, investigator-initiated research can be funded through multi-PI R01s and can also occur through groups of individually funded PIs working together. In special cases, program project grants (P01s) may be appropriate, particularly for long-term, interdisciplinary collaborations that require dedicated core facilities. As we move forward with our strategic planning process, we will be exploring additional ways to support investigator-initiated team science. I invite you to send us ideas you have for how best to do this. On October 16, Congress passed a continuing resolution to fund the Federal Government through January 15, 2014, at Fiscal Year 2013 levels. This short-term budget allows us to begin funding some of the grant applications approved by our Advisory Council in September. However, because the funds we have available are only for a fraction of the fiscal year and we don’t know what the budget for the rest of the year will be, we need to be conservative in our funding decisions until a longer-term budget is approved. Led by NIGMS Acting Deputy Director Judith Greenberg, the directors of the NIGMS scientific divisions developed principles to help us decide which of the many outstanding applications we are considering should receive funding now and which should be deferred for later start dates, if sufficient funds become available after January 15. The fundamental question the division directors addressed was which categories of investigators would face the most serious jeopardy from a delay in funding. Based on the group’s careful deliberations, we will give priority to highly rated applications from investigators who have little or no current support from any source. Within this category, we will generally give priority to competing renewal applications over new applications, although in each case, we will take into account the particular circumstances of the investigator and her/his laboratory. For instance, an application from an early stage investigator who has been a tenure-track faculty member for 4 years, has exhausted all start-up funds and has no additional sources of funding would be considered a high priority. We recognize that a delay in funding presents challenges for every investigator, but we hope you understand that our top priority in these difficult fiscal times must be to ensure the health of the overall biomedical research enterprise in the United States. Keeping productive and promising labs open is an essential element of this goal. There have been a lot of discussions lately at NIGMS about large-scale research initiatives and centers. In these conversations, we have drawn a distinction between initiatives and centers focused mainly on research and those focused mainly on resources. Examples of the latter include our human cell repository, synchrotron light sources, and databases, all of which serve the biomedical community in critical ways and, in most cases, require sustained support. In contrast, many of us feel that the primary purpose of research-focused initiatives and centers is to open untapped scientific areas, providing an initial, targeted investment that enables the research to develop sufficiently so that it can be sustained through other grant mechanisms, such as R01s and P01s. Our discussions have led to the question of whether, when and how research initiatives and centers should be ended. Should all new research initiatives and centers have hard “sunset clauses” built into them, for example at 10 years, similar to what is done for projects funded by the NIH Common Fund? Or should it be possible for them to continue indefinitely as long as they are sufficiently productive? An additional consideration is that many of our currently funded initiatives and centers were developed during the period in which the NIH budget was doubling (see figure). With a large infusion of new investment into biomedical research, it made sense to use a significant portion of the funds to open up new scientific territory through large-scale exploration in ways that were not previously possible. Growth of NIGMS funding for centers (blue bars, left axis) for Fiscal Years 1998-2012. The total NIGMS budget each year during the same period is also shown (red line, right axis). The numbers on top of each blue bar represent the percentage of the total NIGMS budget committed to centers in that year. The data for 2012 do not include the funds for the Institutional Development Award (IDeA) program or the Biomedical Technology Research Centers program, which were transferred to NIGMS from the former National Center for Research Resources in that fiscal year. In the current budget environment, in order to start a new program or bolster support for existing priorities such as investigator-initiated research, other programs must be adjusted or ended. These issues will be central as we begin a strategic planning process to ensure that we are using the most effective and efficient mechanisms to invest the taxpayers’ money in fundamental biomedical and behavioral research. We have already begun carefully examining our existing portfolio of research initiatives and centers and considering how to balance continued support for them with other priorities and opportunities. At last week’s National Advisory General Medical Sciences Council meeting, Council members and staff discussed the future of one existing large-scale program, the Protein Structure Initiative (PSI). The Council heard the results of a midpoint evaluation of the PSI’s third 5-year phase, PSI:Biology. The evaluators found that PSI investigators have determined an impressive number of high-quality protein structures and that some of the program’s accomplishments, including methodological ones, could not have been readily achieved through R01-type investigator-initiated grants. The evaluators concluded that the PSI will reach a point that no longer justifies set-aside funding and, as a result, strongly recommended that NIGMS begin planning the sunset of the PSI, being careful to identify resources developed by the initiative that should be retained for use by the biomedical community. After numerous internal discussions and consultation with the Council, we have decided to follow this advice and begin planning to sunset the PSI in its current format after the completion of PSI:Biology in 2015. We are setting up two transition-planning committees, one made up of NIGMS staff and representatives from several other parts of NIH, and a second made up of scientists from the research community. These committees will work together to recommend the best methods for phasing out the program and identifying critical resources that should be retained. The committees will also suggest emerging challenges and opportunities in structural biology that may require new, smaller-scale targeted support. The committees and NIGMS will need a great deal of input from the biomedical community as this transition-planning process moves forward. I hope that you will freely share your thoughts and suggestions with us, now and in the future. Inflationary increases will be discontinued for all competing and noncompeting awards (both modular and nonmodular). All noncompeting grants will be reduced by 3.5% from the Fiscal Year 2013 committed level. Commitments in Fiscal Year 2014 and beyond will remain unchanged. Overall average costs for competing RPGs will be at approximately the Fiscal Year 2012 level. Inflationary increases for future-year commitments will be discontinued. Fiscal Year 2013 noncompeting awards that have already been issued at a reduced level will be revised upward to reflect the 3.5% reduction. New investigators on R01-equivalent awards will be supported at a success rate equivalent to that of established investigators submitting new (Type 1) R01-equivalent applications. We anticipate funding 758 competing RPGs, with a success rate of 18% (see comparisons for previous years). The stipend levels established in Fiscal Year 2012 will be continued this fiscal year. Noncompeting awards will be reduced by 3.5% from the initial Fiscal Year 2013 committed level. Fiscal Year 2012 ended on September 30, 2012. As in previous years, we have analyzed the funding results (including percentiles and success rates) for R01 grants, shown in Figures 1-5. Thanks to Jim Deatherage for preparing these data again this year. Figure 1. Competing R01 applications reviewed (open rectangles) and funded (solid bars) in Fiscal Year 2012. Figure 2. NIGMS competing R01 funding curves for Fiscal Years 2008-2012. For Fiscal Year 2012, the success rate for R01 applications was 25%, and the midpoint of the funding curve was at approximately the 20th percentile. In Fiscal Year 2012, there was a slight improvement in success rate. This is due in part to the relatively flat number of competing applications that we received (Figure 4). Figure 3. Number of R01 and R37 grants (competing and noncompeting) funded in Fiscal Years 1998-2012. Figure 4. 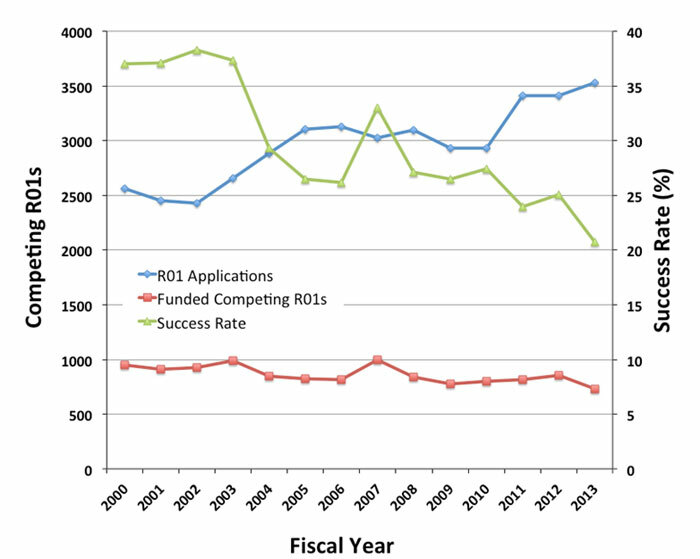 Number of competing R01 applications (including resubmissions) received during Fiscal Years 1998-2012. Below are the total NIGMS expenditures (including both direct and indirect costs) for R01 and R37 grants for Fiscal Year 1996 through Fiscal Year 2012. Figure 5. 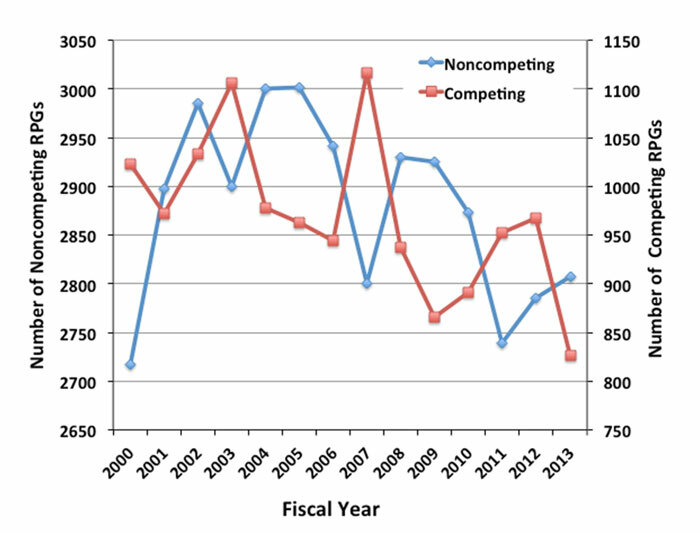 The upper curve shows the overall NIGMS expenditures on R01 and R37 grants (competing and noncompeting, including supplements) in Fiscal Years 1996-2012. The lower curve (right vertical axis) shows the median direct costs of NIGMS R01 grants. Results are in actual dollars with no correction for inflation.